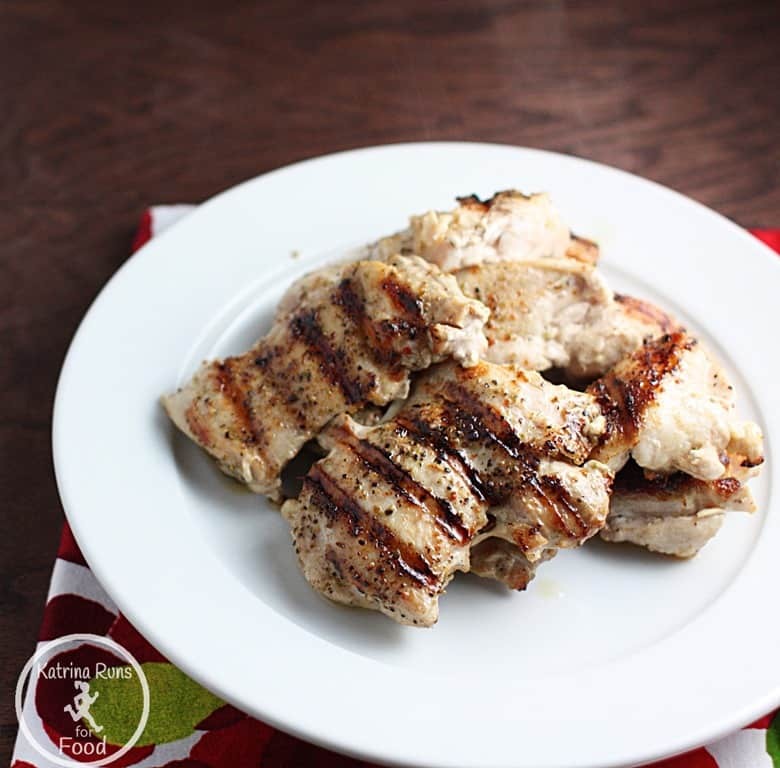 Grilled Chicken Thighs, done right! Here is another one of Melissa Joulwan’s recipes from her first cookbook, Well Fed. I made this several times last year and it is so versatile to change the spices and seasonings for variety. This weekend, I kept it simple. The key to this is a hot griddle pan to get those beautiful crispy grill marks. There is a ton of flavor in brown crispy bites. For Italian flavor, sprinkle with a mix of dried basil, rosemary, thyme. Try Greek seasoning, lemon-pepper, curry, cajun, jerk seasoning blends. Heat your outdoor grill or use a grill pan on the stove. I used a little bacon fat and heated the pan to medium high. I used a large cutting board (plastic! Never use your wooden board for cutting meat/poultry) to spread the thighs out, smooth side up. Sprinkle with pepper, spice, paprika. Flip over and sprinkle the other side. Place chicken, smooth side DOWN, on the grill. Cover and leave it alone. Don’t try to move it. Let it sear for about 4 minutes. Using tongs, gently flip over. Cover and cook 4 more minutes. It is done when juices run clear. I eat these for breakfast, as a snack before a long faculty meeting, lunch, dinner, with soup, on top of greens for salad, diced in fritatta. The possibilities are endless! on the market that will allow you to design your Fanpage to have more functionality. Almost any business can take advantage of web affiliate marketing. can cancel for any reason before the trial period ends. It is a must to create an online business profile for your company. Neuseeland, Deutschland, Westeuropa, usw.. Es gibt eine Reihe von Landschafts-Ideen, die Ihre Familie kann versuchen zu erforschen erstellen . Are you looking to buy SARM’s of excellent quality?